The Asperger’s Difference – Now only $24.99! The Asperger’s Difference is an educational documentary designed to support high-functioning young people with this Autism Spectrum Disorder as they begin the complicated emotional and physical transition into adolescence and adulthood. To make the DVD more available, we’ve cut its price in half to $24.99! Order your copy here or scroll down for more purchasing options. Though intended to guide this target audience as they confront the heightened loneliness and other challenges that can come with their diagnosis in middle, high school and college settings, The Asperger’s Difference has more to offer. As an educational tool, it is perfect for educators, families of those affected by Asperger’s, and others interested in learning more about Asperger’s, and the importance of understanding those with Asperger’s. The Asperger’s Difference stars three articulate young people with Asperger’s as they navigate the waters of their daily life and describe their experiences. Annie, a middle school student, Noah, a high school student, and Jeffrey, a college student, represent a range of ages and circumstances, but share many of the common challenges and strengths of individuals living with AS. The film is presented as a series of visual chapters, and also comes with a Discussion and Resource Guide, making it the perfect educational tool for individuals or groups. You can use your credit/debit card, or PayPal account if you have one, to order The Asperger’s Difference. Simply print and complete our order form and mail it in with your check. Or, for faster service, complete the credit card information and fax us the form. Your order will receive prompt attention. 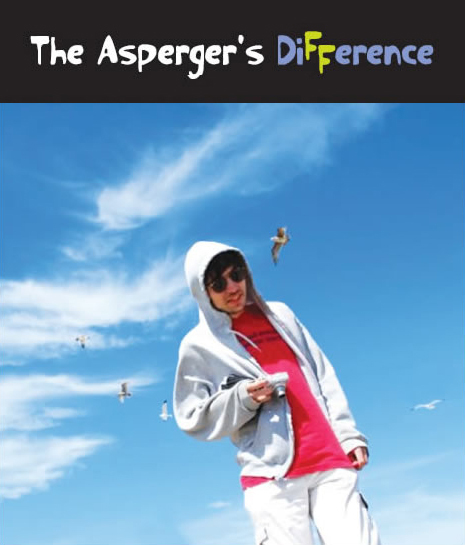 The Asperger’s Difference is also available on Amazon.com. Click Here to order. This excellent DVD would be helpful to students with AS trying to better understand themselves and for all their peers and staff to gain a deeper understanding of what it is like to have AS. I highly recommend this DVD to all school systems and those working with individuals with AS. This DVD will help teenagers who have Asperger’s Syndrome to acquire greater self-understanding and self-acceptance. Author, The Complete Guide to Asperger’s Syndrome and also Asperger’s Syndrome: A Guide for Parents and Professionals. The Asperger’s Difference is a remarkable resource for the AS community. The interviews and narration portray assets and challenges in a matter-of-fact and well-balanced manner. The individuals in the video are articulate, but not scripted or “phony.” The information is presented in brief, visually-supported sections, an approach that matches the learning styles of many individuals with AS. Most importantly, the content is optimistic without becoming unrealistically glowing. The Asperger’s Difference is “must view” for adolescents and young adults with AS, as well as for their families, school teams, and employers. The honesty, vulnerability and forthrightness of the kids really touched me. They weren’t afraid to share their challenges and fears, but were also confident about who they are and willing to talk to others about their needs and challenges. They don’t seem let their diagnoses hold them back and are not shy about participating in activities that put them in the spotlight, such as acting and singing. But they also realize when they need time apart from others and give themselves that break from the social world. I think this DVD will really help others gain a personal insight into Asperger’s and will help those without the diagnosis understand and accommodate kids with Asperger’s. The Asperger’s Difference resonates with what is true for all adolescents and what is uniquely true for those with Asperger Syndrome. The movie’s powerful message is more incisive because we hear it in the words of young people with Asperger Syndrome. It will surely make a difference for anyone with Asperger’s. I would want this movie on the required viewing list for those in the educational or healthcare world working with adolescents — most especially those working with youth with Asperger Syndrome.